Kirit Densira is only a couple of days away from earning her wings and starting her apprenticeship as a trader. But when she breaks one of her city’s laws by attracting the attention of a monstrous predator, her life changes irrevocably, and she finds herself neck-deep in the city’s secrets. 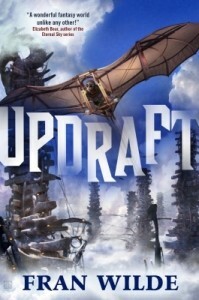 The real star of Updraft is the setting. A city of living bone towers rising above the clouds, where people live within the hollowed out bone and flight is the only way to get around. It’s one of the most unique worlds that I’ve encountered so far, and the author has thought through a million little details that make it feel real – the availability of resources, the different occupations that people have, the way people eat and sleep, how farming would work – to name a few. The description of the world is what made me pick this book to read, and it was as cool as I was hoping it would be. The rest of the book has quite a few rough edges. Kirit is a pretty typical teenager – takes everything that happens far too seriously, utterly convinced that she knows what she wants from life, and incredibly stubborn when the world doesn’t meet her expectations. This works to her advantage for the plot because the people she’s dealing with often aren’t acting with good faith, but it makes her an annoying protagonist, especially because the book is written in first person. It’s hard to empathize with her because we don’t know much about her and what she likes; we just know a lot about what she wants. The writing style and tone of this book reminded me a lot of Red Rising – lots of short sentences, first person, very determined and serious protagonist with no apparent sense of humour (or at least not one shown in the book). That isn’t bad, but it doesn’t work for me as well because I prefer some fun in my books, especially books where everyone’s flying! I mean, it’s really interesting how the author manages to make flying an everyday, unremarkable part of life, and there are some cool flying scenes, but I wanted a lot more. One other thing I was disappointed about was that a lot of what happens towards the end is figured out by Kirit’s associates (kind of like the end of Catching Fire and most of Mockingjay, where Katniss has no idea what is going on and people are just telling her to do things) and it’s a bit boring to see events play out from Kirit’s perspective. For instance, most of the plot surrounding the wingbeaters was just hearsay (they think this, now they think that) but was really important to the plot. I don’t want to imply that this was a bad book, it just didn’t work for me as well I had hoped. I really did enjoy the world, and the characterization was excellent – Kirit’s relationships with her mother and Sellis were particularly well written.